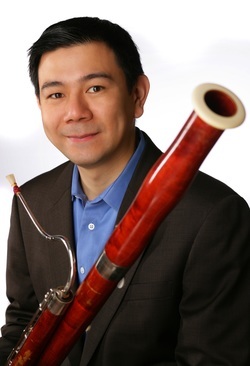 Daniel Matsukawa has been principal bassoon of The Philadelphia Orchestra since 2000. Born in Argentina to Japanese parents, he moved with his family to New York City at age three and began studying the bassoon at age 13. The following year he won his first competition and was featured as a soloist performing the Mozart Bassoon Concerto with a professional orchestra in New York. He was a scholarship student of the pre-college division of both the Juilliard School and the Manhattan School of Music, where he studied with Harold Goltzer and Alan Futterman. Mr. Matsukawa went on to study at Juilliard for two years before attending the Curtis Institute of Music, where he was a pupil of retired Philadelphia Orchestra Principal Bassoon Bernard Garfield. Mr. Matsukawa has been a recipient of numerous awards and prizes, including a solo concerto debut in Carnegie Hall at the age of 18. He was also featured in a Young Artist’s Showcase on New York’s WQXR classical radio station. Since then he has appeared as soloist with several other orchestras, including The Philadelphia Orchestra, the National Symphony, the New York String Orchestra under Alexander Schneider, the Curtis Symphony, the Virginia Symphony, the Auckland (New Zealand) Philharmonic, and the Sapporo Symphony in Japan. Mr. Matsukawa performs and teaches regularly at the Pacific Music Festival and the National Orchestral Institute, and he has been invited by Seiji Ozawa to participate regularly with the Saito Kinen Orchestra. Prior to his post with The Philadelphia Orchestra, Mr. Matsukawa served as principal bassoon with the National Symphony in Washington D.C., the Saint Louis Symphony, the Virginia Symphony, and the Memphis Symphony. In 1998 he performed and recorded Shostakovich’s Symphony No. 7 as acting principal bassoon with the New York Philharmonic under Kurt Masur. Mr. Matsukawa also conducts regularly in Japan, including at the Pacific Music Festival since 2009. He has studied conducting privately with Otto Werner Mueller, who was the head of the Conducting Department at the Curtis Institute of Music. Mr. Matsukawa is a regular member of the faculties at both the Curtis Institute of Music and the Boyer College of Music at Temple University.